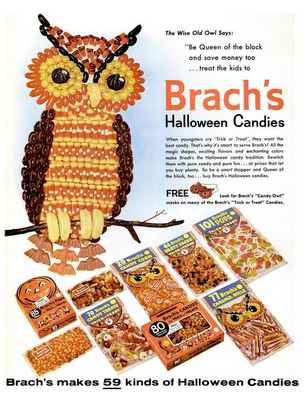 In the 2012 edition of David Ng and Ben Cohen’s Candy Hierarchy, the bottom tier includes “anything from Brach’s,” right between black licorice and hard candy. The American Red Cross is continuing a major relief operation throughout the Mid-Atlantic and Northeast to shelter and assist people affected by Superstorm Sandy. Millions awoke this morning to power outages, fallen trees, scattered debris, and flooded neighborhoods and the Red Cross is working hard to get help where it is needed. You can click on the image to make a donation. After watching Errol Morris’s short film 11 Excellent Reasons Not to Vote? , take a few more minutes to read Robert Reich: If You Succumb to Cynicism, the Regressives Win It All. I found Reich’s post via the always excellent Daughter Number Three. “Coming as it is just a week before Election Day, Sandy makes the fact that climate change has been entirely ignored during this campaign seem all the more grotesque”: Elizabeth Kolbert, Watching Sandy, Ignoring Climate Change (New Yorker). From the Pratt Chat Blog at Baltimore’s Enoch Pratt Free Library: thirty-two films to watch online for free. If you’ve never seen it, I’d suggest starting with Carnival of Souls (dir. Herk Harvey, 1962). It’s unforgettable. Trust me, if you can. From today’s Google homepage. Pocket squirrel: +1. State Fair (dir. Walter Lang, 1945) is corny, goofy, and — I cannot tell a lie — delightful. With six Rodgers and Hammerstein songs, three love stories (two human, one porcine), and two judgings (mincemeat and pickles), there’s something for each member of the family to enjoy. Another delight: seeing Dana Andrews in the role of the Iowa newspaperman Pat Gilbert. 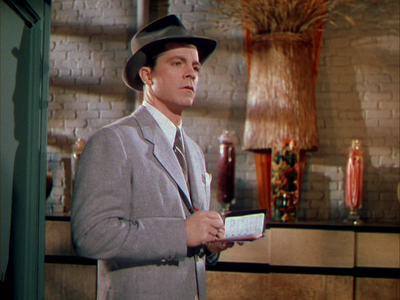 For me, Andrews will always be Mark McPherson, the detective who falls in love with a painting in Otto Preminger’s Laura (1944), and Fred Derry, the bombardier haunted by the horrors of war in William Wyler’s The Best Years of Our Lives (1946). Pat Gilbert is no McPherson or Derry: he seems to be a regular guy who rides the rides and joins in on “It’s a Grand Night for Singing.” But since he’s played by Dana Andrews, I can’t help thinking that Gilbert is in truth a tormented soul working hard to pass for well-adjusted. Thus a value-added viewing experience. Intertextuality FTW. 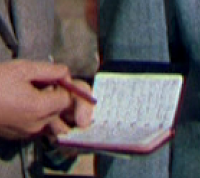 The little six-ring notebook seen above used to be everywhere. I can’t remember the last time I saw one being used in real life. The Obama campaign slogan now has an exclamation point: Forward! And yes, the word forward — followed by a period or an exclamation point, either one — makes a sentence. It’s an instance of the hortatory subjunctive. I still prefer the understated seriousness of the period. Smoking is not permitted in the building, but that doesn’t stop Mac; smoke drifts at all times from the cigarette in the corner of his mouth. A tiny Camel, as you might guess. The smoke makes him squint, and cough. Q. How will we handle “busyness” in the future? Better, because of technology? Worse, because of overload? Both? A. I think the degree and depth of the “busy trap,” where you’re always distracted and trying to catch up, is going to increase, because more people will be affected by it. Things on your mind need to be externalized — captured in some system that you trust. You capture things that are potentially meaningful; you clarify what those things mean to you; and you need maps of all that, so you can see it from a larger perspective. A handy Mac tip from David Sparks at MacSparky: typing date:yesterday in Spotlight produces list of all apps and files that you accessed the day before. I can see date:yesterday being useful as a quick way to get back to some part of the day’s work. If you’ve cleared your browser’s cache, the browser doesn’t show up among apps used. If you use Dropbox with more than one Mac, files you’ve worked with one computer will show up on another. Barzun’s pronouncements on present-day culture leave me cold, but I find his writing on education engaging, persuasive, and often eerily prescient. Romney’s willingness to say anything, take any position, to suit his purpose makes him, in my eyes, a bullshitter. I can tell. Score a hit for Obama. The artist and writer Joe Brainard (1942–1994) gave the world a deceptively simple writing prompt: “I remember,” two words to begin a sentence or a paragraph. The above “I remember” dropped into my head yesterday morning, apropos of nothing. About “wine and cheese”: when I was in college, it seemed that every on-campus event promised, as added attractions, wine and cheese. Impossible now. But what a grown-up way for young adults to learn how to enjoy alcohol: a little food, a little wine, some conversation. Do you remember “wine and cheese”? If not, what do you remember? You’re welcome to leave an “I remember” or two or three or more in the form of a comment. Why not? I forget most of what I have read, just as I do most of what I have eaten, but I know that both contribute no less to the conservation of my mind and my body on that account. Just as there are polysyllabic words that say very little, so there are also monosyllabic words of infinite meaning. Nothing makes one old so quickly as the ever-present thought that one is growing older . . .
From The Waste Books. Trans. R. J. Hollingdale (New York: New York Review Books, 2000). Originally published as Aphorisms (1990). One could do worse than be a reader of New York Review Books books. Bill Madison’s story about Madeline Kahn’s notebook rivals André Gregory’s story about browsing in a surrealist magazine. As Bill says: uncanny. The reëlection of Barack Obama is a matter of great urgency. Not only are we in broad agreement with his policy directions; we also see in him what is absent in Mitt Romney — a first-rate political temperament and a deep sense of fairness and integrity. A two-term Obama Administration will leave an enduringly positive imprint on political life. It will bolster the ideal of good governance and a social vision that tempers individualism with a concern for community. Every Presidential election involves a contest over the idea of America. Obama’s America — one that progresses, however falteringly, toward social justice, tolerance, and equality — represents the future that this country deserves. Watching last night’s debate (or most of it — I had to miss the first twenty minutes) confirmed for me that Mitt Romney is the political version of Infinite Jest’s Orin Incandenza, the pick-up artist who says, “Tell me what sort of man you prefer, and then I’ll affect the demeanor of that man.” I am hoping that American voters won’t get fooled. Earlier this year, Dot was playing a left-handed five-string cello. Sometimes I think the many hands at Hi-Lo Amalgamated just want me to make blog posts about them. George McGovern, speaking in La Crosse, Wisconsin, July 31, 1971. McGovern died on Sunday at the age of ninety. Dropbox works with Linux, Mac, Windows, and mobile devices. It’s wonderfully useful for accessing your stuff and for sharing items (if you like) with others. The cloud makes flash drives seem so early-twenty-first-century. I am a happy user of the Mac text-editor TextWrangler. It’s my favorite writing app, and I like everything about it but its icon. For about five minutes last night, the most important thing for me to do was to find a replacement. And I did. Seth Lilly has created a beautiful one. 1. Download Seth’s 512 x 512 .png image. Rename the file TextWranglerApplication.png. 2. Open Img2icns and create an .icns file from the .png file. (The app will show you how.) The new file will be named TextWranglerApplication.icns. 3. Go to the Applications folder and right-click on TextWrangler. 4. Choose Show Package Contents/Contents/Resources. 5. Find the file TextWranglerApplication.icns and rename it. For instance: TextWranglerApplication.old.icns. 6. Drag your new .icns file to Resources. What spellings of the future have you noticed? The program: George Gershwin’s Cuban Overture and Rhapsody in Blue, Guido Lopéz-Gavilán’s Guagancó, and Felix Mendelssohn’s Symphony No. 4. The highlight for me was the Rhapsody: pianist “Nachito” Herrera made this piece as new and exciting as it must have sounded in 1924. (He and the orchestra took a few liberties, which I won’t reveal here.) Added delights: two national anthems (you can guess which ones) and three encore pieces. Last night’s performance was one of the most memorable orchestral concerts I’ve heard. I’m not sure that I’ve ever seen more good will between musicians and an audience. If the National Symphony Orchestra of Cuba comes your way: go. ¹ Could it just be that my head is filled with images of mid-twentieth cars still moving through the streets of twenty-first-century Havana? No, I don’t think so. I’ve almost never used the word sketchy to mean anything but “giving only a slight or rough outline of the main features, facts, or circumstances without going into details” (Oxford English Dictionary). Indeed, if I use the word when talking with a student about, say, an underdeveloped idea in an essay, I make it a point to distinguish my use from current slang. So I am amused to realize that last night I immediately understood sketchy to mean “iffy” and “questionable,” even though the word could have been taken to mean only that the deal was lacking in detail. 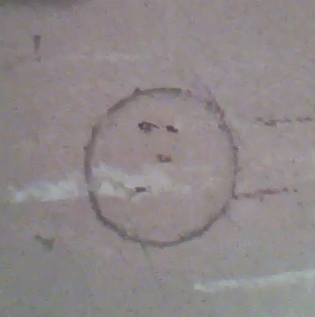 It is lacking in detail, but it’s also sketchy. 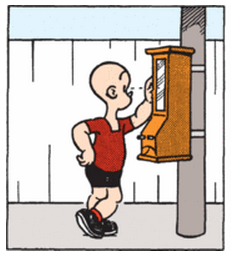 One can never have too many gum machines on the streets of one’s comic strip. Barack Obama just characterized Mitt Romney’s mysterious tax-proposal as “a sketchy deal.” Too true. I am delighted to hear sketchy in its slang sense in a presidential debate. 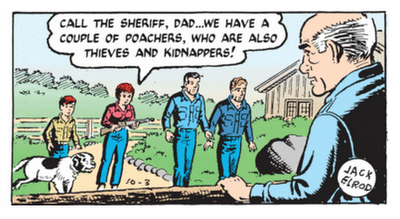 As dedicated Mark Trail readers know, facial hair is the mark of a villain. Long sideburns and a mustache are dead giveaways. (Guns are another clue.) The man in red must be a rogue town-haller who insists on doing things his way. Things do not look good for Mitt Trail in tonight’s debate. As dedicated Orange Crate Art readers know, I have long suspected that D-list comic-strip hero Mark Trail and Mitt Romney are the same (two-dimensional) person. If you need more proof: more Mitt Trail posts. 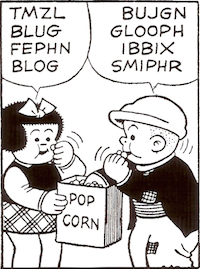 Today’s Hi and Lois offers yet one more additional variation on a theme by Slylock Fox. Can you count the differences between the panels? More disturbing than the panel-shifts though is the black slab on or outside the window. Monolith? 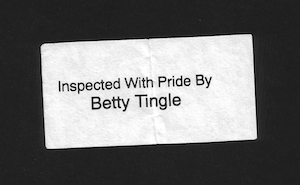 I discovered this 2" x 1" inspection slip Saturday night in the inner right-hand pocket of a tweed jacket. It’s the kind of jacket my son Ben once called a “professor jacket.” (That term is now part of our fambly’s vocabulary.) This professor jacket is by Lands’ End, and is old enough to have been made in the United States. I’ve had it for well over a decade, perhaps closer to fifteen years. Betty Tingle, if you’re out there: I finally got your message. The jacket was perfect at the start and has held up well. The inspection slip bearing your name has gone back to the inner right-hand pocket. The way a presidential candidate campaigns for office matters to the country. A campaign should demonstrate seriousness of purpose and a set of core beliefs, and it should signal to voters whether a candidate shows trustworthiness and judgment. Those things don’t seem to matter to Mitt Romney. From the beginning of his run for the Republican nomination, Mr. Romney has offered to transfigure himself into any shape desired by an audience in order to achieve power. Yep, Proteus. But Proteus didn’t aim to please an audience. I’m reminded less of the ancient shapeshifter and more of Orin Incandenza, the tireless seducer of David Foster Wallace’s Infinite Jest. 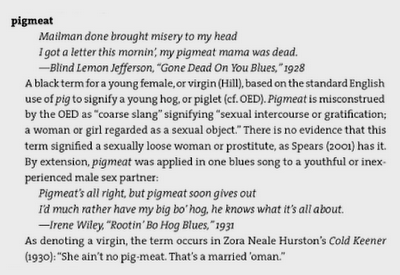 In a letter that forms the content of a long endnote, a former friend describes one of Orin’s pick-up strategies: Orin would approach a woman in a bar or at a dance and say, “Tell me what sort of man you prefer, and then I’ll affect the demeanor of that man.” The difference between Governor Romney and Orin Incandenza: Orin acknowledges that it’s an act. The strangest part: the name of Orin’s former friend is Marlon Bain. From the essay “Reading,” in The Dyer’s Hand and Other Essays (1962). The ages might vary, but it’s sound advice. It reminds me — don’t laugh — of what management consultant Peter Drucker says in Managing Oneself (2008): that we must figure out our strengths and values and ways of working, and be who we are. 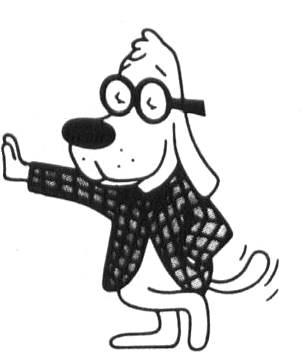 When I was a much, much younger fellow, perhaps just a tad bookish, my so-called peers bestowed upon me the nickname Mister Peabody. Ugh. But now I celebrate the Peabodily elements of my style. I was delighted beyond reason this past summer when a Scot called me mate. But I think I’ve typed my last cheers. The New York Times reports on America’s slippery slope into Britishisms. I’ve had the October 7, 2004 reprint of this strip taped to the side of a reading carrel since, well, uh, 2004. An excellent tea with a deep, strong flavor and not a trace of bitterness. Better than Twinings Irish Breakfast, and cheap. And about words on paper: when Elaine and I were browsing in an excellent used-book store a couple of weeks ago, we noticed that every other customer — and there were many — was a young (or younger) adult, digging the pages. Yes, the candidates disagree: Mitt Romney debates himself. 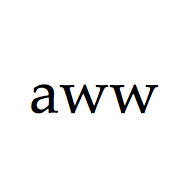 A wonderful word from the Greek: apotropaic. It has something to do with turning, yes? But what? Merriam-Webster’s Collegiate has the etymology: “Greek apotropaios, from apotrepein to avert, from apo- + trepein to turn.” That which is apotropaic is “designed to avert evil,” to turn it away. It’s curious and fitting that the thing averted forms no part of the word itself. Speak no evil. Apotropaic got me thinking about apo-, which has a range of meanings: away from, off; detached, separate; formed from, related to. Thus for instance, apocalypse, to uncover, disclose. And I now see that word in a new way, as I recall that the name Calypso in Homer’s Odyssey is related to the verb kaluptein, to cover. Keeping Odysseus on her island, removed from human culture, Calypso is a concealer, a burier. Wikipedia has a page on apotropaic magic, with photographs of painted eyes averting evil. I got thinking about apotropaic during a trip to a museum, where I saw the word in a description of an ancient Greek drinking bowl. “I found myself wondering recently whether the word odor has negative connotations or not. This led me to write a list of other nouns pertaining to that sense we exercise with our noses”: Daughter Number Three investigates the origins of words that name smells and finds a clear pattern. Does Hardee’s understand what Carter was singing about? Given the company’s history of hyper-sexualized advertising, perhaps they do. 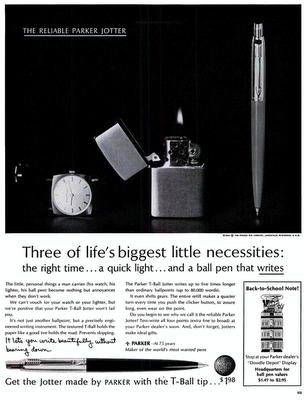 The Parker T-Ball Jotter is the first pen I remember using with pleasure, back in childhood. Yes, I was precocious, in some ways if not others. I have been writing for a month now with another Jotter, one that long stood unused in a cup of pencils and pens near my desk. It’s an excellent ballpoint, and a perfect pen for writing comments on student writing: the T-Ball (T for tungsten) has just enough tooth to slow the pen down a bit and give my hand a measure of control. Neatness counts, especially when more and more students have difficulty reading anybody’s handwriting. What I most like about the pen though is that its design is virtually identical to that of my childhood Jotter. This 1963 Life advertisement recalls a gone world, when everyone wore a watch and close to half of American adults smoked cigarettes. (The Report of the Surgeon General’s Advisory Committee on Smoking and Health would be published on January 11, 1964.) 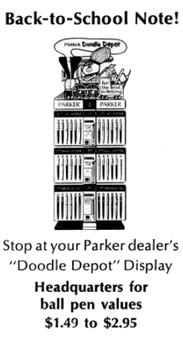 I’m amused to see that despite the association of the Jotter with grown-up stuff, Parker was also selling to the young. Perhaps my first Jotter come from a Doodle Depot. “I’ve come to the conclusion that handwriting is good for us. It involves us in a relationship with the written word that is sensuous, immediate and individual”: Philip Hensher, Why handwriting matters (Guardian). Count von Faber-Castell on pencils Now with a link to a short clip of the Count talking about pencils with Martha Stewart. Thanks, Sean. Elaine and I saw The Master (dir. Paul Thomas Anderson, 2012) yesterday and were both disappointed. The film’s cinematography (Mihai Malaimare Jr.) is beautiful. As Lancaster Dodd and Freddie Quell, Philip Seymour Hoffman and Joaquin Phoenix give great performances. The former suggests to me Charles Foster Kane; the latter, Neal Cassady. The Master is worth seeing for its imagery and acting. But on many points — that’s all I’ll say, no spoilers — the film is vague and inchoate. I’m all for mystery and opacity. But vagueness, not so much. Q. Will the pencil go the way of the quill pen? A. May I ask you a question? Have you ever seen a paperless office? People may not be writing things out on legal pads but they like to print out e-mail and make notations. Then pencils and pens disappear and you go grab another. Yes, there are executive types who have their e-mail printed out for them, but e-mail annotation seems like a dubious basis for resisting extinction. And Faber-Castell pencils are hardly the semi-disposable supply-room products that disappear from desks in a workplace. I wish that the Count had spoken of the pencil as a tool for writing. People are indeed writing things out on legal pads, on music paper, and in notebooks. Why not proclaim the tactile joys of writing on paper? 6:54 p.m.: Here’s the Count talking about pencils with, of all people, Martha Stewart. Thanks, Sean. A candidate who seeks to add $2 trillion to military spending while eliminating funding for PBS has a very strange sense of proportion and deeply mistaken priorities. A phrasal verb has caught my eye and imagination: to shark up. In the first scene of Hamlet, Horatio reports that young Fortinbras has “Sharked up a list of lawless resolutes,” a band of desperados. The Oxford English Dictionary explains: “to collect hastily (a body of persons, etc.) without regard to selection.” The New Penguin Shakespeare text that I have at hand suggests that to shark up might be meant to suggest a shark “seizing its prey at haphazard.” The expression appears to originate with Shakespeare; the OED cites texts from 1827 and 1900 that echo the line I’ve quoted. Clearly, the time has come to revive this phrasal verb. One might describe any quick and undiscriminating effort as a matter of sharking up. Put together an hour of music by pulling out ten random recordings: you’ve sharked up a radio show. Toss some arbitrarily chosen sources into a piece of writing (for a teacher who requires, say, the magical “five sources”): you’ve sharked up a Works Cited list. It’s better though to work hard, choose carefully, and not shark things up. At Plannerisms and the Quo Vadis Blog, some thoughts about the future of paper planners. I suspect that such planners will be around for many more years, if only from a smaller and smaller number of “specialty” retailers in larger cities and online. In that respect, the paper planner may come to resemble a fountain pen or phonograph needle. I like paper. As David Allen says, paper is “in your face.” In my face, since 2007: the Moleskine page-a-day pocket planner. If it disappears, I will likely make DIY planners from plain old Moleskine notebooks. Let me suggest that after you watch the debate on Wednesday night, you turn off your television set and do your best to avoid the spin that will follow. Talk about what you saw and heard with your family, your friends, your neighbors, your co-workers. You are smarter than the spinners. Minow has been involved in every televised presidential and vice-presidential debate. I like the informality of the contraction even better. This advice makes me think of Harvey Pekar’s “Keep on pushin’,” also good advice. Here’s a page with the results of an effort to track down Squire Bill Widener. I hope this advice still holds. Some expect very little from Mitt Romney tonight. Not me. I expect both body language and facial expressions, visible at all times on a split-screen. And I expect that Governor Romney will deliver his “zingers” in a way that makes clear the month-plus of rehearsal he has put into them. If I were Cherry Trail, I would also be wondering where my husband is. He’s been missing from the strip for weeks now. Preparing, perhaps, for a debate. The reply was most likely automatic. But if I were working in telemarketing and had to field calls for Romney and Ryan, that’s exactly the secret message I’d give a fellow Obama supporter. I am happy to have missed the Beach Boys’ (so-called) reunion, a gathering of five musicians who had never before played as a group. Given the Boys’ history, an ugly end may have been fated. The Financial Times has a review of the next-to-last show, which featured Love making fun of Darian Sahanaja’s name. Stay classy, Mike Love. 1:02 p.m.: In the comments, Andrew Hickey suggests that Love wasn’t making fun of DS’s name. Having listened, I agree with him. I think though that my final sentence still applies. 8:19 p.m.: Andrew Hickey has written a detailed review of the tour’s last show. Letters of E. B. White, ed. Dorothy Lobrano Guth (New York: Harper & Row, 1976). There is no inflexible rules, all righty! Someday I shall make a trip to the attic, examine the original manuscript, and find out whether I really wrote that. Meantime, I plan to burn my typewriter and scatter the ashes over Lower Fifth Avenue. 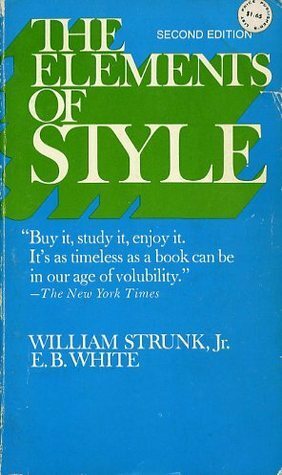 I snagged a hardcover copy of the second edition of The Elements of Style for a modest price in a used-book store this past weekend. The cover alone was worth it.